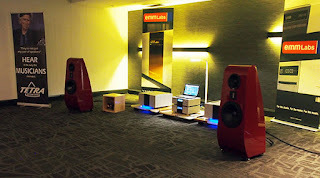 The other half of the huge room where Steve Silberman gave his Roon presentations was shared by loudspeaker manufacturer Tetra and amplifier/DAC manufacturer EMM Labs. Taking price of place at the front of the system was the DV2 D/A processor ($30,000) that had impressed Jason Victor Serinus in our March 2019 issue, which was connected to two 500W MTRX monoblocks ($85,000/pair). Loudspeakers were the new three-way Tetra 707s ($78,000/pair), which feature a ribbon tweeter, a horn-loaded dome midrange unit, and a 12" woofer. "Hear it the way the musicians intended" declares Tetra's publicity and while I have no idea how Chicago-based singer/songwriter Terry Callier intended his "Cotton Eyed Joe" to sound, both voice and softly strummed acoustic guitar, streamed from Tidal, were reproduced by this system with power, palpability, and presence.